As an article in The Washington Post reveals, influential radio broadcaster and confirmed false prophet Harold Camping is at it again. The end of days, according to Camping, is set for May 21, 2011. Camping has made this same prediction, but for a different date, in the past. Sherman, set the Wayback Machine for August of 1994. I was living in Fallbrook, California and on a particularly beautiful SoCal Saturday morning, I took my two young daughters out for breakfast at a coffee shop. While my girls nibbled at their muffins and sipped chocolate milk, a friendly, sixty-ish gentleman struck up a conversation with me. Within moments he had deftly guided the discussion into spiritual matters; I was very young in my Christian faith at that time and quite stimulated by the dialogue. Then, suddenly, he leaned in and motioned at me to come closer. With an air of urgent secrecy, the man whispered to me that the Christ was coming the following month, on September 6th, 1994. He explained that a modern prophet and radio broadcaster had done some calculations from the book of Daniel and conclusively determined that Christ was returning for His bride, the church, on that date, and the world would burn soon after. “He proves it in here,” he said, holding a book out to me. It was entitled 1994? and it was written by Harold Camping. I had never heard of him. The man’s face fell and he shook his head in exasperation. Throwing up his hands with a sigh, he said, “I’ve done what I could. You’ve been warned.” He stood up and left. Needless to say, September of 1994 came and went and the world did not end. Flash forward to a cold Friday evening, November 6th, 2009. The Mrs. and a group of ladies from our church were standing in line outside the Prairie Capitol Convention Center in Springfield, Illinois. They had come for a Beth Moore conference. Many folks were handing out all manner of tracts and fliers to those in the queue, but one in particular caught my wife’s eye. It was a leaflet declaring that May 21, 2011 would be Judgment Day. The source of the prediction was, naturally, Harold Camping. Is Jesus coming back? Nothing could be more certain. Do the conditions of our world today closely resemble the signs the Bible gives as indications that Christ’s return is imminent? Without a doubt. But only God knows when that day will come. 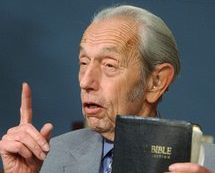 Harold Camping’s date-setting prophecies have shown his abuse of God’s inerrant word, specifically Matthew 24:36. To study and follow Camping’s teachings is an exercise in the scatalogical, not the eschatalogical. Those who would follow a proven false prophet today only show their ignorance of Deuteronomy 18:22. In other words, when a “prophet’s” prediction is shown to be fiction, to still call him “prophetic” is simply pathetic. You have my permission to stitch that on a throw pillow. « Come visit our new family blog!